Papa Murphy’s #DadMoments Big Green Egg Sweepstakes – Win a Big Green Egg & more! 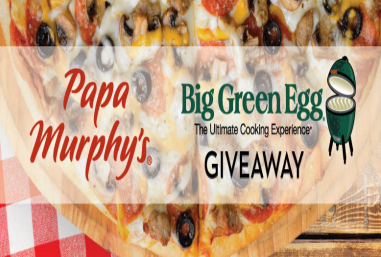 Win a Big Green Egg grill and a $100 Papa Murphy’s gift card! ENTER SWEEPSTAKES HERE – Papa Murphy’s Facebook page. ENTRY LIMIT – Each entrant may receive one entry per day during the Sweepstakes Period. ELIGIBILITY – Open only to legal residents of the 50 United States and the District of Columbia who are at least 18 years old at the time of entry. SWEEPSTAKES ENTRY PERIOD – The Sweepstakes begins on June 9th, 2016 at 9:00 a.m. PDT and ends on June 19, 2016 at 11:59 p.m. PDT. 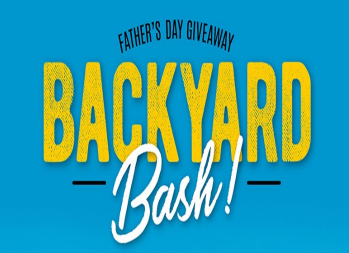 PRIZES – One grand prize winner will receive: (1) Big Green Egg Grill and Accessories valued at $1,200 approximate retail value and (1) $100 Papa Murphy’s gift card. 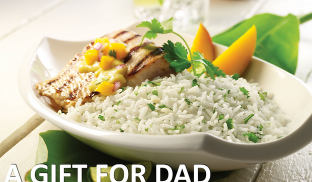 Mahatma® Rice Father’s Day Sweepstakes – Win an Aroma 3-in-1 Grillet & a coupon for rice! Win One Aroma 3-in-1 Grillet™ and one coupon for a free package of Mahatma® Rice (4 winners)! ENTER SWEEPSTAKES HERE – Mahatma Rice Facebook page. ELIGIBILITY – Entrants must be legal residents of the 50 United States or District of Columbia (“U.S.”) who are 18 years of age or older at the time of entry and with a valid social security number or TIN. SWEEPSTAKES PERIOD – Between 12:00 am CT on June 1, 2015 through 11:59 pm CT on June 21, 2015. Tommy Bahama® Aloha Maui Jim® Sweepstakes – Win a trip to Maui! Win a trip for 2 to Maui & more! ELIGIBILITY – Tommy Bahama® Aloha Maui Jim® Sweepstakes (the “Sweepstakes”) is open only to legal residents of the fifty (50) United States (including District of Columbia) who are at least eighteen (18) years old at the time of entry. SWEEPSTAKES PERIOD – The Sweepstakes begins on June 2, 2015 at 12:00 a.m. Eastern Time (“ET”) and ends on July 6, 2015 at 11:59 p.m. ET. PRIZES – ONE (1) GRAND PRIZE: A trip for two (2) to Maui, Hawaii. Trip package includes round-trip coach-class air transportation from an airport near winner’s home (determined by Sponsor in its sole discretion) to Maui, Hawaii; seven (7) nights’ accommodations at a hotel determined by Sponsor in its sole discretion (single room, double occupancy); rental car for length of stay (make and model determined by Sponsor in its sole discretion); a fishing trip on a Maui Jim boat; a snorkeling trip; a zip line adventure; dinner for two (2) at Tommy Bahama Wailea (menu determined by Sponsor); two (2) pairs of Maui Jim sunglasses (style determined by Sponsor); a $1,000 shopping spree at Tommy Bahama (awarded as a gift card); and travel agent services. Approximate Retail Value (“ARV”): $10,200. 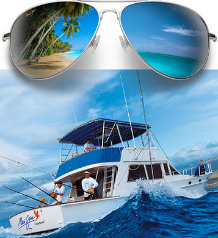 TEN (10) FIRST PRIZES: A pair of Maui Jim sunglasses (style determined by Sponsor in its sole discretion). ARV: $200. 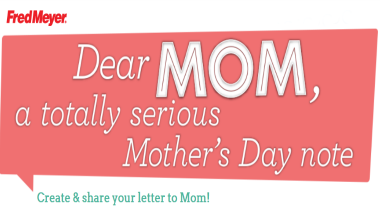 Serta’s Always Comfortable with Dad Sweepstakes – Win a BBQ gift pack & more! Win a BBQ gift basket, an Omaha steak package & 2 iComfort Scrunch pillows! ENTER SWEEPSTAKES HERE – Serta Facebook Sweepstakes page. ELIGIBILITY – Legal residents of the 50 United States, and the District of Columbia and Canada (excluding residents of Quebec), who are the age of majority or older are eligible to enter. 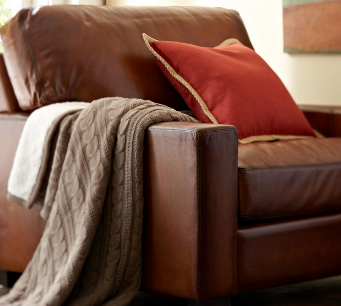 SWEEPSTAKES PERIOD – Serta’s Always Comfortable with Dad Sweepstakes begins at 10:00 a.m. CDT on June 8, 2014, and ends at 11:59 p.m. CDT on June 14, 2014. PRIZES – Seven (7) First Prizes: Each First Prize winner will receive one (1) Serta Counting Sheep Plushie. The approximate retail value (ARV) of the First Prize is $4. One (1) Grand Prize: Grand Prize winner will receive one (1) BBQ Gift basket; one (1) Omaha Steak Package; and two (2) iComfort Scrunch Pillows. ARV of Grand Prize is $333. ARV may vary based on pillow selected. Boboli’s Fire Up Father’s Day Sweepstakes – Win a trip to the 2014 MLB All Star Game & more! Win a trip to the 2014 MLB All Star Game, a $250 gift card and a Char-Broil Grill! ENTER SWEEPSTAKES HERE – Boboli Facebook page. ENTRY LIMIT – Limit one (1) Entry per person using only one (1) e-mail address per household for the duration of the Sweepstakes Period. ELIGIBILITY – Sweepstakes is open to legal residents of the fifty (50) United States and the District of Columbia, who are 18 years of age or older. 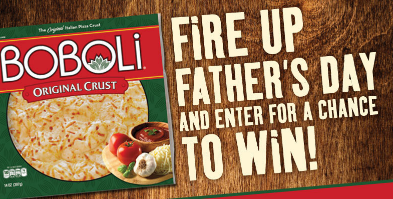 SWEEPSTAKES PERIOD – Boboli’s Fire Up Father’s Day Sweepstakes starts on June 1, 2014 at 12:00 a.m. Eastern Time (“ET”) and ends on June 25, 2014 at 11:59 p.m. ET. PRIZES – GRAND PRIZE (1): A trip for winner and one (1) guest to the 2014 MLB All Star Game scheduled to take place in Minneapolis, Minnesota on July 15, 2014. Trip includes round-trip coach air transportation from major U.S. gateway airport nearest winner’s residence (as determined by Sponsor) to Minnesota for winner and one (1) guest, three (3) nights standard hotel accommodations (one (1) room, double occupancy), two (2) tickets to the game, a $250 gift card for winner only that may be used for meals and ground transportation while on trip, and a Char-Broil grill. Approximate Retail Value of Grand Prize package (“ARV”): $7,450. Tommy Bahama Father’s Day Sweepstakes – Win a weekend getaway in Laguna Beach! Win a trip for 2 to Laguna Beach, California, a $1,000 Tommy Bahama gift card & more! ELIGIBILITY – Tommy Bahama Father’s Day Sweepstakes is open only to legal residents of the fifty (50) United States (and the District of Columbia) and Canada (excluding Quebec), who are at least eighteen (18) years old at the time of entry. SWEEPSTAKES PERIOD – The Sweepstakes begins on May 30, 2014 at 12:00 a.m. Pacific Time (“PT”) and ends on June 15, 2014 at 11:59 p.m. PT. trip, coach-class air transportation for two (2) from a major airport near winner’s home (determined by Sponsor in its sole discretion) to Laguna Beach, CA; two (2) nights’ accommodations at a hotel determined by Sponsor in its sole discretion (single room, double occupancy); a $1,000 Tommy Bahama gift card; two (2) Surfrider memberships; two (2) stand up paddle boards; two sets of paddles; a custom surf board; dinner at Tommy Bahama restaurant; ground transportation to and from destination airport and hotel; and $500 spending money. Approximate Retail Value (“ARV”): $14,410.